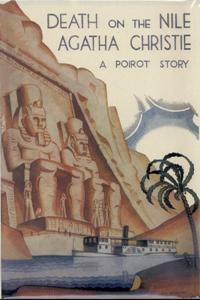 While on holiday in Cairo, Hercule Poirot is approached by successful socialite Linnet Doyle. She requests his help in deterring her friend Jacqueline de Bellefort from hounding and stalking her. Linnet had recently married her friend's fiancé, Simon Doyle, which has made Jacqueline bitterly resentful of her. Poirot refuses the request, but attempts unsuccessfully to dissuade Jacqueline from pursuing her plans further. Simon and Linnet secretly board the steamer Karnak, set to tour along the Nile, to escape her, but find she had learned of their plans and boarded ahead of them. Apart from them, Poirot travels on the steamer, while the other passengers include Linnet's maid Louise Bourget, her trustee Andrew Pennington, romance novelist Salome Otterbourne and her daughter Rosalie, Tim Allerton and his mother Mrs. Allerton, American socialite Marie Van Schuyler, her cousin Cornelia Robson and her nurse Miss Bowers, outspoken communist Mr. Ferguson, Italian archaeologist Guido Richetti, solicitor Jim Fanthorp, and physician Dr. Bessner. While visiting an ancient temple, Linnet narrowly avoids being crushed by a falling rock. Jacqueline is initially suspected, but she is found to have been aboard the steamer at the time of the incident. During the return voyage, Poirot finds his friend Colonel Race has joined the steamer. He reveals to him that he seeks a murderer amongst the passengers. Later that night in the steamer's lounge, Jacqueline's resentment of Linnet boils over, leading her to shoot Simon in the leg with a pistol she possesses. She is taken back to her cabin by those who witness this, where she is confined, while Simon is treated for his injury; in that time, Jacqueline's pistol, which she dropped, disappears. The following morning, Linnet is found dead, having been shot in the head, while her valuable string of pearls has disappeared. No one in the cabins on the opposite side heard or saw anything. Poirot notes two bottles of nail polish in the victim's room, one of which intrigues him. Jacqueline's pistol is later recovered from the Nile; it is found wrapped in a stole belonging to Miss Van Schuyler, which was stolen the previous day, and which has been fired through. When interviewing the maid Louise in the cabin in which Simon is resting, Poirot notes an oddness in the words she uses. Soon afterwards, she is found stabbed in her cabin. Mrs. Otterbourne later meets with Poirot and Race in Simon's cabin, claiming she saw who killed the maid; Simon declares loudly his surprise at this. Before she can reveal who it is, she is shot dead from outside the cabin. Poirot soon confronts Pennington over his attempted murder of Linnet at the temple - he came to Egypt upon learning of her marriage to Simon, to trick her into signing documents that would exonerate him of embezzling her inheritance. However, he did not murder Linnet on the steamer, despite his gun having been used in Mrs. Otterbourne's murder. Race later arrests Richetti, the man he sought. Poirot recovers the missing pearls from Tim, who substituted an imitation string of pearls for the real ones. The imitation pearls were later stolen by Miss Van Schuyler, a kleptomaniac, and returned by Miss Bowers. When alone with Simon, Poirot reveals him to be his wife's killer. The murder was not his plan, but Jacqueline's; the pair were still lovers. Their scheme was to steal Linnet's money - the pair staged their break-up, whereupon Simon married Linnet. On the night of the murder, Jacqueline deliberately missed Simon, who faked his injury with red ink. While everyone in the lounge was distracted by Jacqueline, he took her gun that she had deliberately discarded, went to Linnet's cabin, and shot her. He then returned to the lounge and shot his own leg, to give himself a genuine injury. Louise and Mrs. Otterbourne were murdered by Jacqueline, who was warned by Simon when the plan was going awry - Louise witnessed Simon entering Linnet's cabin that night, and gave him a coded message when Poirot was interviewing her; Mrs. Otterbourne witnessed Jacqueline entering Louise's cabin before stabbing her. Poirot reveals what led him to his theory: the ink was contained in a bottle of nail polish he noticed in Linnet's cabin; Simon reloaded the gun with two spare cartridges before he disposed of it, as Poirot realized that three shots were fired that night; the stole was used to silence the gun when Simon shot his own leg; Poirot suspected pre-meditation for the murder, because he slept deeply through that night's events - he had been drugged through his wine that evening. As the steamer arrives back in Cairo and the passengers disembark, Jacqueline shoots Simon and herself with another gun she possessed, so they may escape the gallows. When pressed, Poirot reveals he had known she had a second gun, but had sympathetically chosen to allow her to take her own life. In The New York Times Book Review for 6 February 1938, Isaac Anderson concluded after summarizing the set-up of the plot that, "You have the right to expect great things of such a combination [of Agatha Christie and Hercule Poirot] and you will not be disappointed.". In The Observer's issue of 14 November 1937, "Torquemada" (Edward Powys Mathers) started off by saying, "First this week comes Agatha Christie. She scored, I contend, two outers in her last three shots; but she is back on the very centre of the bull with Death on the Nile." He summarized the set-up of the plot and then continued, "Terrible things happen and, without the formality of breaking off her narrative to issue a challenge, the author allows Poirot to summarize his clues in one compressed paragraph sixty pages from the end. It is after that, until the retired but by no means retiring little Belgian chooses to tell us the truth, that we are very angry with ourselves indeed. When he does so, anger is swallowed up in admiration. The appearance of corpse after corse [sic] in the feast of death is entirely logical, and the main alibi, unshakable except for Poirot, is of the first brilliance. It is no less likely than the run of such things in fiction, and is built not with many preliminary falsifications but almost in a single carefully premeditated flash of movement." He concluded, "Though less than secondary, the descriptive work is adequate and hits, as it were, the Nile on the head." The Scotsman of 11 November 1937 said, "An Agatha Christie story, and especially one with Hercule Poirot applying his 'little grey cells,' is always an event. It is a matter of opinion whether this author has a superior in giving an unexpected twist to concluding chapters, but it is arguable that she has none. In Death on the Nile, however, the solution of the mystery does not come with all that sudden shock of surprise to which Agatha Christie 'fans' are accustomed. At least it should not, providing that one carefully reads a certain chapter and is willing to pursue to their ultimate implications certain hints dropped by Poirot. Whether or not the reader will succeed in naming the murderer, by which is meant discovering how the crime was committed, and not just guessing at one of the least likely persons, is another matter. In any case, here is a problem eminently worth trying to solve." The review finished by saying that, "the author has again constructed the neatest of plots, wrapped it round with distracting circumstances, and presented it to what should be an appreciative public." E.R. Punshon of The Guardian in his review of 10 December 1937 began by saying, "To decide whether a writer of fiction possesses the true novelist's gift it is often a good plan to consider whether the minor characters in his or her book, those to whose creation the author has probably given little thought, stand out in the narrative in their own right as living personalities. This test is one Mrs. Christie always passes successfully, and never more so than in her new book." He went on to summarize the more outlandish traits of some of the characters and then said, "each and all of these, as well their more normal fellow-passengers, are firmly and clearly sketched, even if they are all a little too much types rather than characters and so miss that full rotundity of life a Dickens or a Thackeray can give." He finished by saying that, "M. Poirot's little grey cells had indeed been obliged to work at full pressure to unravel a mystery which includes one of those carefully worked out alibis that seem alike to fascinate Mrs. Christie and to provide her with the best opportunities for displaying her own skill. A fault-finding critic may, however, wonder whether M. Poirot is not growing just a little too fond of keeping to himself such important facts as the bullet-hole in the table. If he is to enjoy all, a reader should also know all." In the revised version of his A Talent to Deceive (1990), Robert Barnard would write: "One of the top ten, in spite of an overcomplex solution. The familiar marital triangle, set on a Nile steamer. Comparatively little local colour, but some good grotesques among the passengers – of which the film took advantage. Spies and agitators are beginning to invade the pure Christie detective story at this period, as the slide towards war begins." The novel was adapted into a highly successful feature film, released in 1978 and starring Peter Ustinov for the first of his six appearances as Poirot. Others in the all-star cast included Bette Davis (Miss Van Schuyler), Mia Farrow (Jacqueline de Bellefort), Maggie Smith (Miss Bowers), Lois Chiles (Linnet Doyle), Simon MacCorkindale (Simon Doyle), Jon Finch (Mr. Ferguson), Olivia Hussey (Rosalie Otterbourne), Angela Lansbury (Mrs. Otterbourne), Jane Birkin (Louise), George Kennedy (Mr. Pennington), Jack Warden (Dr. Bessner) and David Niven (Colonel Race). The screenplay differs slightly from the book, deleting several characters, including Cornelia Robson, Signor Richetti, Joanna Southwood, the Allertons and Mr. Fanthorp. Tim Allerton is replaced as Rosalie's love interest by Ferguson. The novel was adapted as a five-part serial for BBC Radio 4 in 1997. John Moffatt reprised his role of Poirot. The serial was broadcast weekly from Thursday, 2 January to Thursday, 30 January at 10.00am to 10.30pm. All five episodes were recorded on Friday, 12 July 1996 at Broadcasting House. It was adapted by Michael Bakewell and directed by Enyd Williams. An adaptation for the ITV television series, Agatha Christie's Poirot, was made for the show's ninth series. It starred David Suchet as Poirot, and guest stars included Emily Blunt as Linnet, JJ Feild as Simon Doyle, Emma Griffiths Malin as Jacqueline, James Fox as Colonel Race, Frances de la Tour as Mrs. Otterbourne, Zoe Telford as Rosalie Otterbourne and David Soul as Andrew Pennington. The episode was filmed in Egypt, with many of the scenes filmed on the steamer PS Sudan. The characters of Miss Bowers, Jim Fanthorp and Guido Richetti are omitted from the adaptation. Due to the omission of Richetti, Race's reason for boarding the boat was changed. In the adaptation, he meets with Poirot after having been on a diplomatic mission, and decides to journey back with him, rather than travel on a government vessel. Poirot does not encounter Jacqueline and Simon in London, but in Cairo while on holiday in Egypt, when the former taunts and torments the latter and his wife Linnet. Tim and Rosalie do not fall happily in love with each other at the end of the adaptation. Instead, he gently refuses her advances, on the ambiguous implication that he is either gay, or in a relationship with his mother, which is implied to be a questionable fact by the adaptation. Louise's body is found in her wardrobe during the search of the ship, and not under her bed. The adaptation changes various elements of the scene regarding the first attempt on Linnet's life by Pennington. In the revised scene, the incident takes place at an old temple, in which a piece of the roof falls and nearly misses Linnet and Simon. Poirot confronts Pennington about this, knowing he was not in the temple but on the roof at the time, to which he reveals that he had knocked it off by accident, not in desperation or with intent to kill. Jacqueline is not on the boat when this happens, nor on the temple's roof, but near Linnet and Simon, taunting them with knowledge about an Egyptian goddess with the features of a cow. References to real life events appear to set this episode in late 1932, though the SS Normandie only entered service in 1935, but there is some confusion here: Ferguson refers to "a lunatic about to take power in Germany", suggesting a pre-1933 setting, but a later shot of Pennington's luggage label shows the date of his sailing on the Normandie as "January 1936". In November 2017, it was announced that 20th Century Fox is developing Death on the Nile as a sequel to their version of Murder on the Orient Express. Michael Green was announced as penning the script and Kenneth Branagh was expected to return as Poirot and as director. It was originally scheduled for release on 20 December 2019, up against Star Wars: The Rise of Skywalker, but on 16 October 2018, Fox delayed the film release date to 2 October 2020. On 28 September 2018, it was announced that Gal Gadot was the first member of the cast signed on to the film, playing the role of Linnet. Armie Hammer, Jodie Comer and Letitia Wright have joined the cast of the film as Simon Doyle, Jacqueline de Bellefort, and Rosalie Otterbourne, respectively. The book was first serialized in the US in The Saturday Evening Post in eight installments from 15 May (Volume 209, Number 46) to 3 July 1937 (Volume 210, Number 1) with illustrations by Henry Raleigh. ^ Kit, Borys (20 November 2017). "'Murder on the Orient Express' Sequel in the Works (Exclusive)". The Hollywood Reporter. Retrieved 21 November 2017. ^ Hermanns, Grant (23 June 2018). "Fox Sets Release Dates For Death on The Nile, Spies in Disguise & More". ComingSoon.net. Archived from the original on 24 June 2018. Retrieved 25 June 2018. ^ N'Duka, Amanda (15 October 2018). "Tom Bateman To Reprise Role In 'Death on the Nile' Adaptation At Fox; New Release Date Set". Deadline Hollywood. Archived from the original on 16 October 2018. Retrieved 15 October 2018. ^ Fleming, Mike, Jr. (28 September 2018). "'Gal Gadot To Star In 'Death On The Nile' Redo At Fox". Deadline Hollywood. Retrieved 30 September 2018. ^ Sommers, Kat. "'Killing Eve' Star Jodie Comer is All Set to Board 'Death on the Nile'". BBC America. Retrieved 23 April 2019. ^ "'Black Panther' Breakout Letitia Wright to Star in 'Death on the Nile' (Exclusive)". The Hollywood Reporter. Retrieved 23 April 2019.